There is no word from any of the mobile operators of US and Canada till now about exact Samsung Galaxy S III release date. All we have in our hand now is rumor. 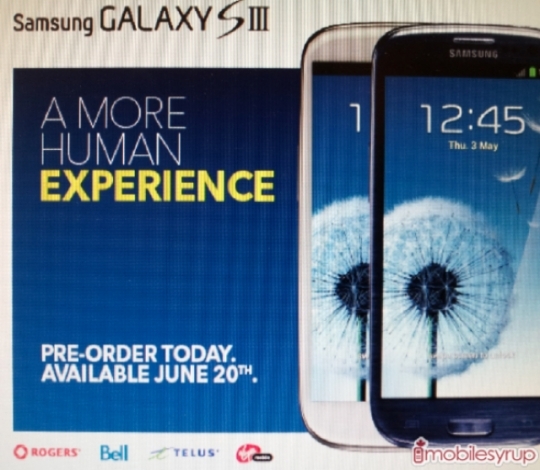 According to a leaked screenshot by the MobileSyrup.com, the Samsung Galaxy S III is expected to go on sale in Canada on June 20. Under the date we have the logo of four mobile operators- Rogers, Bell, Telus and Virgin Mobile, who will be selling the phone on launch day. There is no way to tell about the contract price of these carriers at this point. But expecting for the worst may be an option. Coincidently TMoNews is reporting that T-Mobile in the US will also be getting the Pebble Blue variant on the same day, with the Marble White version arriving on July 11 and only in 16GB variant. There is no other word about any other operator of US.